This is a fun and hilly 10k ‘runseeing’ tour of Porto, featuring some of the highlights of the historical center and some modest parks. Many of the streets are small and narrow, and wayfinding can be a bit challenging. We start in Liberty Square (Praça) at the Estátua do Ardina, and run west to the Clérigos Church and Bell Tower. near the (great views from the top!). RIGHT on Rua do Dr. Ferreira da Silva, by the Ramalho Ortigão Statue and the Leões fountain. Run by the baroque Carmo, with its tiled side facade. Head through Carlos Alberto Square, and then right on Rua de Cedofeita, to Rua Boavista, the main street and then LEFT to the Rotunda Boavista. Pass the São Martinho de Cedofeita Church, and note the contemporary Music Hall. Exit the Rotunda and head south, passing a rather charmless shopping mall, and take R. de Padre Cruz, then LEFT on Rua da Torrinha, passing the maternity hospital. RIGHT on R. da Boa Hora, and follow the main road, with the Palace Pinto Leite on your right, into the Crystal Palace Gardens (km 5), which feature wonderful walking paths and great views of the river and city. Run through the Gardens, and then by the round Gymnasium building and the Garden of Feelings, toward the river and the Porto Wine Museum. You’ll then run EAST along the river for about 1.5 km, toward the Luis 1 Bridge. Leave the water by bearing LEFT on R. do Infante D. Henrique, passing the gardens and the Casa do Infante museum, the LEFT on R. do Dr. Sousa Viterbo to R. de Belomonte, where a RIGHT turn will take you to the Porto Cathedral area, where there are other important sites: Bolsa Palace, Paço Episcopal, Pillory of Porto, the Muralha Fernandina fortification, and numerous other museums and monuments. Note: in this area there are several points where there are stairs leading up to old walls and fortifications. At the Batalha furnicular, which heads to the Ribeira on the river, turn LEFT for the final 2k, on R. de Augusto Rosa, then bearing RIGHT on R. de Entreparedes, passing the Church of Saint Ildefonso, the Coliseu do Porto performing arts center, and make your way back to the historic Bolhão Market, with its neoclassical building. 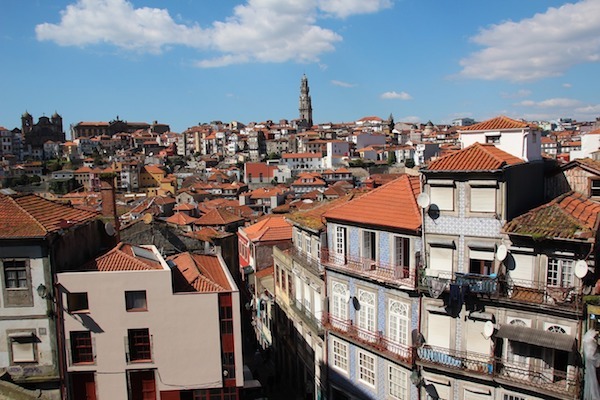 Add-On: from the Porto Cathedral, take a quick jaunt to Ribeira, over the Luis 1 Bridge, and then around the Monastery and the Hill Garden of Morrow. Great views. Adds ~1 km each way.